I hope you never find yourself in a situation where you need to initiate a wedding vendor break up. Sadly, it does happen, and sometimes the best thing for all parties involved is to split ways. Of course the HOPE is that you encounter phenomenal wedding vendors who take wonderful care of you & your fiance. But let’s face it – sometimes personalities clash, you fall in love with another photographer or caterer, or someone who you totally trusted simply flakes out. 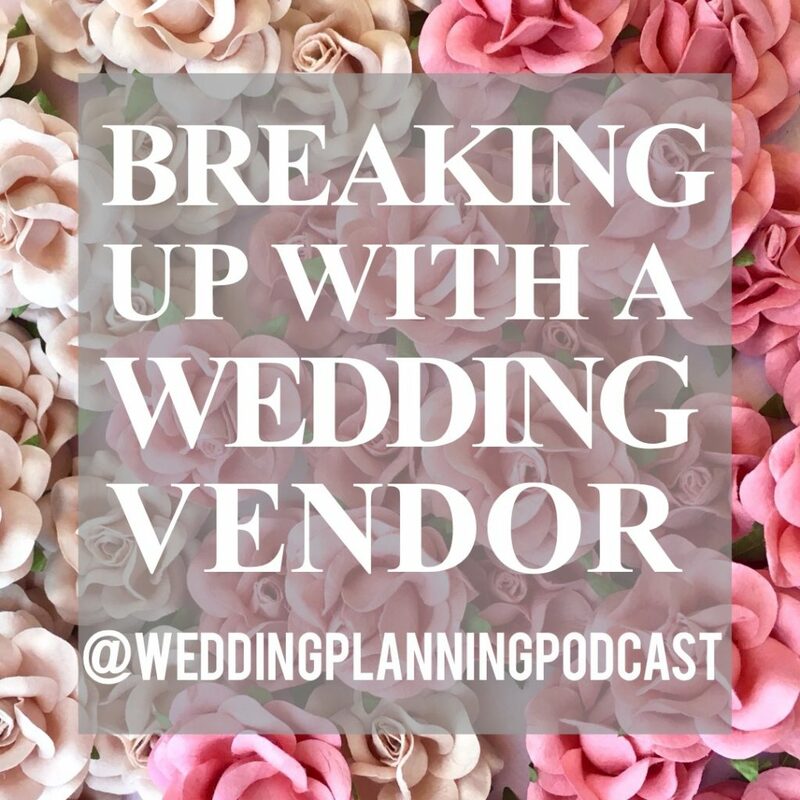 In today’s show, I share some solid advice for handling a wedding vendor break up with style and grace. We review steps to take & critical things to consider before you part ways – listen now, or enjoy the complete show transcript below! What if a wedding vendor you’ve hired just doesn’t work out? Thankfully, most wedding vendors are on the up and up, and they love what they do. Unfortunately, there may be situations where a wedding vendor break up is inevitable. For example, maybe you find yourself with a wedding planner who isn’t returning your phone calls & emails. The company you contracted to do your linens suddenly can’t provide what they promised they would. Or throughout a series of interactions with your photographer, you start to fear that your styles are different, and it’s leaving you with a pit in your stomach. Let’s review some classy ways to handle potentially breaking up with a wedding vendor. If you’re dealing with a vendor who’s being non-responsive, resist the urge to blow up their inbox and phone with passive-aggressive messages. Take a deep breath, send a final email, AND make a final phone call. And you simply must follow up with a phone call. With a non-responsive wedding vendor, it’s very important to follow up your email with an actual telephone call. This phone call should open with the exact language of your email. Also important, give them a chance to explain their side of the story. Did you misunderstand the contract? Did they have a family emergency? A sincere apology and promise that it won’t happen again may be just what you’re looking for. Be honest with yourself here too – Are your expectations reasonable? For example, sending your wedding planner emails multiple times daily with simple questions and expecting an immediate response to every single message perhaps isn’t realistic. Communication is key – send that email, make that phone call. Connect, and candidly talk through your concerns. In most cases, this will be enough to smooth things over. Refresh your understanding of the contract, make your future expectations clear. At the same time, be respectful of the professional you’ve hired. If days go by after your email and phone call, and still no response? Now may be the time to initiate a wedding vendor break up, and go another direction. Follow @weddingplanningpodcast on Instagram for even more behind-the-scenes fun! So you’ve decided that you need to part ways with a vendor. We used your wedding planner as the past example, but this could happen with your photographer, florist, even your venue. Before going any further down the wedding vendor break up path, take a close look at your contract. Make sure you fully understand if you will be forfeiting your deposit, and how much you will forfeit. The contractual details will be very different, depending on each individual situation. Simply not being happy with someone is not a legitimate reason to breach a contract with a wedding vendor. Once you sign a contract and put a deposit down, you are locked in, and financially committed to that vendor. Parting ways may end up costing you a lot of money, which may or may not be worth it. Let’s say you’ve communicated back and forth with an artist on Etsy to do your calligraphy on wedding day menus and guest place cards. What if the vendor is someone who you really had your heart set on working with, but you’re finding that things are not going as you had imagined? Be honest with yourself, honor your gut feelings, and make a clean break. A bride had sent a total of 30 messages back and forth with a calligraphy artist on Etsy, and around message 10 or so, began to have a nagging feeling that it wasn’t going to work out. Things were becoming too complicated, and she wondered if she should just save the money, and have a bridesmaid write her guest names. By message 20, she felt bad about wasting the calligraphy artist’s time, and ended up paying to have the menus and place cards done despite her doubts. In the end, the calligraphy artist flaked out after accepting payment, and let the bride know just one week before the wedding that she wouldn’t be able to complete the cards after all. Whether it’s an independent small business in your area, or someone you found on Etsy who is doing custom work for you, be very upfront. Politely and clearly let them know that you’ve decided to go another direction and cut it off at that. Don’t string it along with wishy-washy messages. Do both of you a favor and cut to the chase. You can explain to them as much as you feel comfortable with. If it’s been a truly unacceptable level of service and you think they should know, then explain your disappointment. If you would feel more comfortable simply saying you know you have changed your mind and decided to go in another direction that’s fine too. YOU HAVE THE RIGHT TO CHANGE YOUR MIND! If you run into a situation where you’re not feeling happy with the way the relationship with a vendor (or potential vendor) is progressing, I DO want you to understand that you have a lot of power as the consumer. You have the absolute right to change your mind and to let any vendor know that you have simply decided to go another direction. I interviewed multiple wedding planners during my engagement who I wasn’t comfortable with, and although it can be awkward to tell someone you’re not going to move forward, you’ll be doing yourself a favor and saving a lot of potential trouble going forward. Remember – if this is someone who you’ve already put a deposit down with and then you’re changing your mind about whether or not you want to work with them, you’re going to want to contact that vendor right away to understand their flexibility, and the exact consequences of breaching a contract. Look at your contract and understand what it stipulates. There are situations where you can walk away from the contract with minimal loss. For example, you hire a wedding photographer, sign a contract, and put down a deposit. But after your engagement shoot, you question whether you made the right decision – the interaction between them and your fiancé was awkward, and you didn’t feel like you really connected the way you thought you would. Some wedding vendors are more flexible than others. If you felt awkward and lack of connection, chances are high that they felt the same way. An honest conversation may be all it takes to mutually agree to cancel the contract. The more time the better – if the wedding vendor has a year or more to fill your wedding date with another couple, they may be more willing to cancel the contract. A big ticket item like your venue may be less likely to cancel a contract without the financial consequence of losing your deposit. They may hold fast to a breach of contract, and with something like a venue, this could mean losing thousands of dollars. Don’t panic – say you’re feeling really unhappy with your venue after your initial walkthrough with the events manager. Before you freak out over breaching the contract and losing your $5,000 dollar deposit, talk to the owner. Be upfront and fair about all of your concerns, and give them the opportunity to fix the things that are bothering you. Last note – if you find yourself in doubt about a wedding vendor you’ve hired, keep things in perspective. Talk it through with your fiance. Address your concerns with the vendor. If things are unbearable and you can’t come to a resolution, then there are times where a lost deposit might be the right decision. In most cases, I trust that you’ll find honesty and candid conversation are just the thing to fix the problem. Loved this episode on “Wedding Vendor Break Up”? 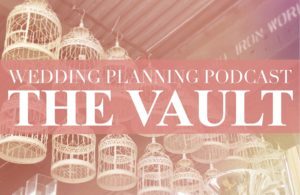 Access 75+ member’s only episodes of the Wedding Planning Podcast in The VAULT.